In this remarkable and engrossing book, Michael Tisserand reveals why zydeco’s identifiable and unforgettable blend of blues and Cajun influences has made the dance music of Louisiana black Creoles so popular and widespread. Zydeco’s appeal runs deeper than the feel-good, get-up-and-dance reaction it invariably elicits and is intertwined in the music’s roots and rhythms, handed down from generation to generation. Here is the story of zydeco music. Tisserand goes on the zydeco trail to meet the major artists; he reconstructs the legends behind the music’s beginnings, offering complete biographies of pioneers such as Amédé Ardoin and Clifton Chenier; and he takes you into the dance halls and onto the front porches where zydeco was born and continues to thrive. More than a book on a musical style, The Kingdom of Zydeco is an exploration and a celebration of a distinctive American culture. 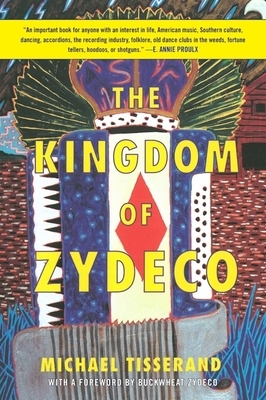 Michael Tisserand's first book, The Kingdom of Zydeco, won the ASCAP-Deems Taylor Award for music writing. He is also author of the Hurricane Katrina memoir Sugarcane Academy and the forthcoming biography Krazy: George Herriman, a Life in Black and White. He lives in New Orleans, Louisiana. Buckwheat Zydeco is the stage name of Stanley Dural, Jr, an American accordionist and zydeco musician. His band, Buckwheat Zydeco and Ils Sont Partis Band, has performed with a large number of famous musicians from Eric Clapton (with whom he also recorded) and U2 to the Boston Pops, and they have appeared on the Late Show with David Letterman, CNN, The Today Show, MTV, NBC News, CBS Morning News, and NPR’s Weekend Edition.